What would it be like if you were able to handle the many frustrations and challenges of your life without turning to food for comfort, soothing, distraction, pleasure and excitement? Have you ever wondered why some people can keep many of their favorite comfort foods in the house, eat one small portion at a time, and save the rest for later? Those same folks can go to a buffet or social gathering with an abundance of delectable foods and fill up one level plate, go back for a small amount of dessert, and that’s it. They’re done. They don’t go back for seconds and thirds. And they don’t keep thinking about food. If having too many favorite “trigger” foods around overwhelms you and leads to mindless or excessive snacking, overeating, or bingeing, then this book is for you. Can you imagine your life free of worries about your health or your weight? Can you picture yourself feeling good every day and liking what you see reflected back in the mirror? You were born with a phenomenal mind, body, and spirit that give you a multitude of signals everyday. Emotional signals like feelings of joy, happiness, love, and contentment, and cognitive signals like empowering, positive, pleasant thoughts, let you know that your inner world is calm and serene. Physical signals like hunger, thirst, cravings, and fullness guide you to take the best care of your body and stay in balance. And spiritual signals like inspiration, purpose, and passion inform you that you’re taking good care of your soul. This book will help you address the true causes of your overeating or imbalanced eating. If you regularly eat when you’re not hungry, choose unhealthy comfort foods, or eat beyond fullness, something is out of balance somewhere. Recent advances in brain science have uncovered the crucial role that our early social and emotional environment plays in the development of imbalanced eating patterns. When we do not receive consistent and sufficient emotional nurturance during our early years, we are at greater risk of seeking it from external sources, such as food. Despite logical arguments, we have difficulty modifying our behavior because we are under the influence of an emotionally dominant part of the brain. The good news is that the brain can be rewired for optimal emotional health. When Food Is Comfort presents a breakthrough mindfulness practice called Inner Nurturing, a comprehensive, step-by-step program that will teach you how to nurture yourself with the loving-kindness you crave and handle stressors more easily so that you can stop turning to food for comfort. Improved health and self-esteem, more energy, and weight loss will naturally follow. “WHEN FOOD IS COMFORT is an excellent guide toward self-awareness, understanding, attunement, love, and ultimate loving self-control. It is also extraordinarily comprehensive and well written. One of the best ways to conquer a problem is to follow the lead of someone who has successfully overcome that very same issue. Julie Simon tells us how she won the battle against unwanted overeating and how she has helped countless others to do the same during her long and productive career. As a wellness activist, I’ve observed first-hand how challenging overcoming emotional eating can be. Despite our best intentions, many of us find ourselves regularly snacking mindlessly and overeating at meals. Clearly, emotional eating is a symptom of deeper issues. 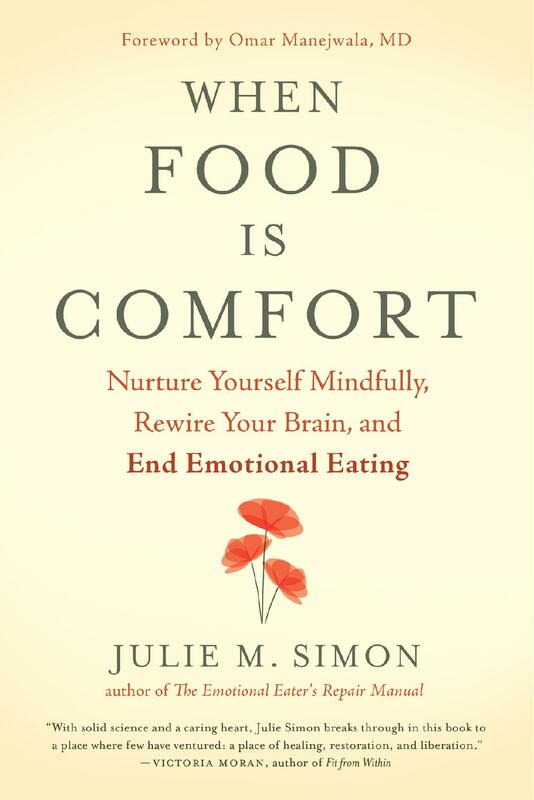 Well written and comprehensive, When Food Is Comfort helps us understand the role early nurturance plays in both the etiology and continuation of eating challenges. Julie’s simple, yet powerful plan, developed in her highly successful 12 Week Program, gets at the root causes of the problem. She gives readers all the tools they need to address the disconnection fueling their eating. If you, or anyone you care about, are struggling with emotional eating, this book is a must read.